The subject of this very large interior painting is the Coffee House, the Cafe.....often the site for liveley discussion, or heated debate. 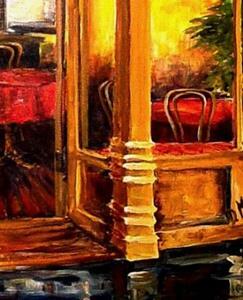 It is painted with large, brush strokes in a modern impressionist style. It is unframed, mounted on reinforced stretcher bars, ready for framing. If you choose to hang it unframed, the edges of the canvas are painted a dark charcoal color. (A convenient picture kit is included for instant hanging.) 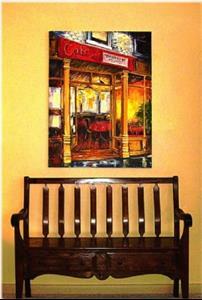 This is a one-of-a-kind original, and would certainly become a focal point in your home. A signed certificate of authenticity is included. 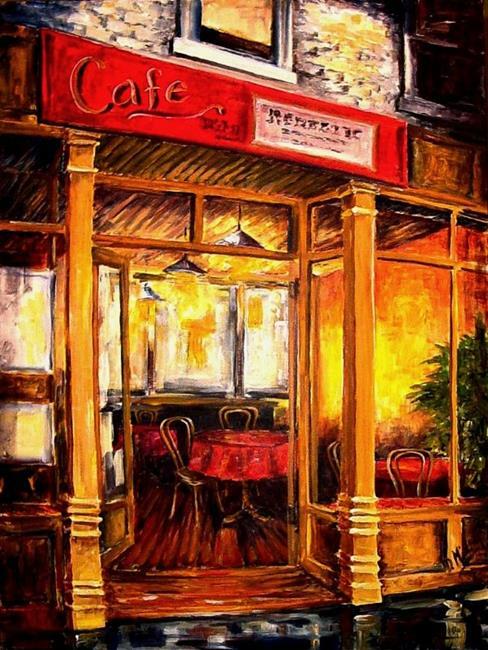 ARTIST'S STATEMENT: I guess coffee houses are a favroite of mine, because I love to talk. Thanks for your interest!